Schedule an appointment to have one of our friendly home comfort advisors visit your Orlando home and share customized options for your home comfort needs. Not all air conditioning companies do what it takes to make sure you have the properly sized equipment needed to keep your home comfortable. Our highly trained comfort advisors use the latest software programs to perform a system load calculation for your Orlando home. This ensures that the cooling and heating system is properly sized, supplying you with the perfect level of comfort year-round. You know your air conditioning isn’t working, but you’re not sure if that means you need an entirely new system or just a repair. We’re here to help you keep your Orlando home comfortable in every season. Call One Stop Cooling and Heating at 407-459-8916. We will send a certified technical advisor to your home to identify the problem with your cooling system and provide you with a complete diagnosis, including a no-obligation price to repair the problem. 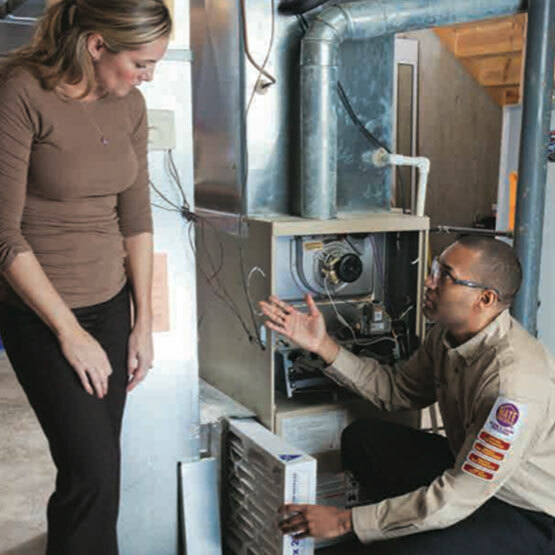 Your technical advisor will determine the level of efficiency at which your AC system is currently operating and make a recommendation as to whether the repair investment is justified. If the system’s efficiency has declined, he/she can provide you with an estimate range to replace it. If you decide you would like more information on a replacement air conditioning system, we will provide a detailed, written quote on the perfect system for your home and lifestyle.